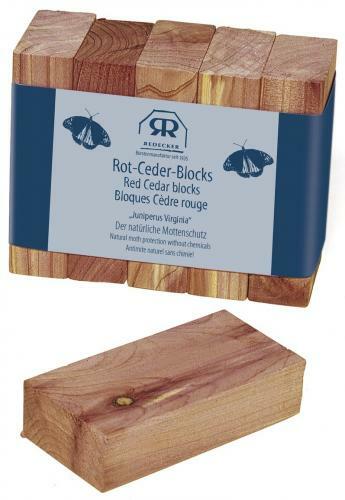 RED CEDAR BLOCKS - Care, Fragrance and moth protection for your favourite clothing. Use cedar wood products to deter moths from your clothing. Place 2-5 cedar pieces per wardrobe in such a way they are not covered by clothes. 2 pieces per draw or stroage compartment is sufficient. You can place the cedar items on a piece of paper to protect clothing from the oils in the cedar. When the scent begins to fade use a light grade sand paper to revive the scent. *Biocide notice: Natural, biological agents to fight moths and other pests fall under biocide guidelines according to an EU directive and must be labelled with warnings.